How to automate your backup with Synology NAS with Dropbox or OneDrive? In this post I’ll explain the structure and scheme that I personally use for backup. It’s not the cheapest, not the easiest, and perhaps not the safest method, but after trying several options, I believe this setup provides balance between price, accessibility and data integrity. The two main objectives here were: 1) eliminate any monthly payments, and 2) combine local redundancy and free cloud storage services. Folks who already have a some knowledge with backup systems will perhaps only need the schema above to understand the setup, but I’ll detail everything after the jump. Disclaimer: I’m not a specialist nor a professional in this complicated area of backup and security. There are other solutions out there, and it is possible that for you, this isn’t the ideal one. This is why I say I’m posting my specific case. Use your critical thinking! Lastly, I am not sponsored or paid by any of the brands/companies in the article. The main element in my setup is a Synology NAS server. I am using the DS214play which has two 3Tb HDDs. Unfortunately I can’t tell if this setup is possible with other NAS brands (probably not) because different NAS servers use different OSs. To make things “worse”, I am using Synology branded apps, so I am not sure if there are there are persices app matches for other brands (probably not). That said I am going to give some alternative recommendations after explaining how my system works. With the NAS installed on the local network – I recommend it’s installed in another room at your house/apartment, connected via Ethernet (wired network) if possible – and after initial configurations made, you;d want to install two apps: Synology Cloud Station and Synology Cloud Sync. Synology Cloud Station – this app will build a storage and synchronization system that works similarly to most known cloud systems (Dropbox, Google Drive, OneDrive, iCloud, etc), only locally. The app also has links for the client counterparts to be installed on your own devices (in my case: Desktop PC, Smartphone and tablet). Take a look at my initial scheme (first image on this post) on the folder named CloudStation. 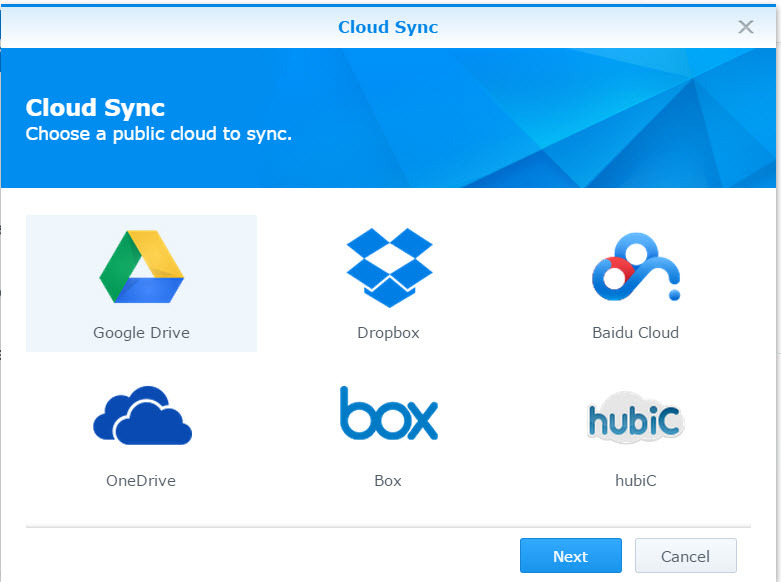 Synology Cloud Sync – similarly named, this app works only inside the NAS (and has no clients), to synchronize the NAS with cloud storage services. It’s something like your Dropbox app on the PC, only it handles several different services and several accounts in one single app. The image above shows the main services it supports (and there are more). To use it, you must first create accounts in each of those services. I have a free account in several of them. With the accounts created and passwords in hand, use the NAS system to connect to each of those accounts, one by one. The app connects to the services using their own APIs, but you don’t need to worry about that… only that you’ll need to give specific permission to each one of them so the whole thing works. Here comes the “trick” that I use so that my system synchronizes everything among devices, NAS and cloud automatically: When you configure each of the drive accounts (Dropbox, Google Drive, hubiC, etc), create a subfolder for each of those services INSIDE the Synology Cloud Storage folder (in my personal case, the CloudStation folder) on the NAS. 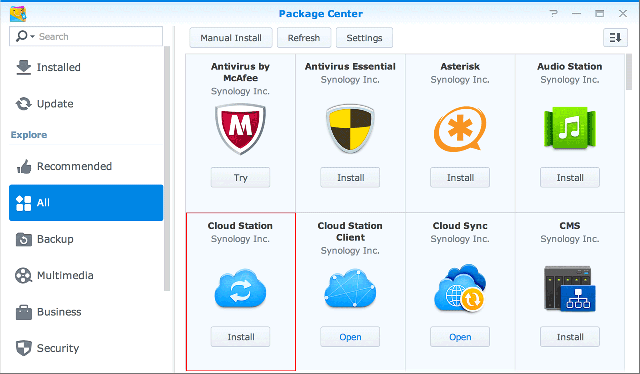 In practice, this forces all folders related to cloud storage services to also be synchronized on the local network using Synology Cloud Storage, assigning the NAS to connect and sync with cloud services by itself, using Synology Cloud Sync. With this, you also won’t need to install those services (Dropbox, Google Drive, etc) on your devices, since it becomes the NAS responsibility to handle it. Example: you copy new photos inside the CloudStation\Dropbox subfolder in your Desktop PC. The Cloud Station app on the PC syncs with the NAS, copying the photos there. Then, the NAS uploads the photos to Dropbox servers using Cloud Sync. You now have 3 copies in 3 different locations done automatically (Desktop PC, NAS and Dropbox). With this, we have the functionality of Synology Cloud Station plus Synology Cloud Sync added up, with local storage on your devices and NAS, plus cloud storage, all automatic. With this system set up, what I did then was sketch a chart with how much space I have in each of the cloud storage services, plus some other specs, to decide what I should put in each folder. Example: I have only 4Gb of space on Dropbox, so I set it aside for text documents, a selection of finalized .jpg photos, and other small files. On OneDrive, I have around 30Gb free space, so I’m saving full video project folders in it. On Google Drive I have only 5Gb, but the service is now connected to Google Photos that gives you unlimited space for those, so all supported photos goes there. Another step into automatization: set the standard folders for you photo editor, video editor and/or text editor inside those. This way, everything you create with those will automatically be sync’ed. Even more advanced scenario: Synology Cloud Sync allows you to choose the file types that the service can synchronize. So if your space is limited, but you’d still like to sync at least some important files in a given service, it’s possible to filter those. Example: you have a project folder with tons of different raw files, but wants to sync only jpg and mp4 files, it’s possible to do it. Extra space on cloud services: you just need to either pay for them, or to open extra accounts. Unfortunate: Synology Cloud Sync still doesn’t support Mega, Flickr and some other services that gives you a TON of space free. Users have been asking for those in the forums though, so perhaps it’ll come in future updates. On my tablet, I have a temporary folder which I need that everything thrown there to also be backed up on the NAS, but with one way sync. Meaning that everything I copy into the folder on the tablet is also copied to the NAS, but if I erase files on the tablet, it’s NOT erased on the NAS, and it’s also not copied back again into the tablet. Example: there’s a folder on my tablet (Temporary) in which I put a collection of videos, photos, art, music and sound effects for an editing job. But on the tablet, it’s only important to me that after using all those, the only thing that remains is the final result, because I have limited space. Problem is that, even though I have limited space and it’s necessary to delete files to free it up, those original files that I used for the project needs to be backed up – for future jobs and restores. Which is why I need everything backed up on the NAS, but not necessarily on the tablet. This is usually how a backup service works – without the bidirectional synchronization of cloud storage. But with this solution, the copies will be made every time a new file is included. By comparison, most backup services will ask for a certain time interval for backups to be made (ex: once a day, once a week, etc). This special case can also be used for local smartphone image and video backup, when you don’t want to use cloud services, whatever the reason is. For those cases, the app I found was BitTorrent Sync – available for Synology NAS, Windows, OSx, Android, iOS and several other systems. It works in a similar way to Cloud Station, but with one key difference: the app allows one of the connected sides to be “Read Only”. That is, you can read and copy files, but can’t erase or modify. Let’s say you need some extra safety, or other physical locations (to provide protection against disaster scenarios). It’s possible to connect your Synology server to another Synology server that is in another location (state, country, whatever). Or, you can use one of the apps for remote backup. Services like Amazon Glacier, or Elephent drive (this will cost money, mind you). If you are more tech savvy you can try connecting to crashplan -though this requires some shell expertise. This is something I need specifically, but it’s worth sharing. I have a PC and a tablet running Windows 10 which are used only by myself. As many, I have the habit of throwing everything on the Desktop Area, and only putting some order to it when the mess becomes intolerable. I have seen this with many creatives. I started thinking if there was a way to not only backup the Desktop, but also to synchronize it between my PC and my tablet. This was I won’t have to worry about cleaning up and organizing two different Desktops all the time. The answer is pretty simple, but may have eluded you if you don’t know how to move your desktop..
You would want to open Windows Explorer, click with the right mouse button on the Desktop folder, choose Properties, “Location” tab, and then redirect it to a subfolder (create a new one) inside the Cloud Station folder. Once you do that with all the devices you need, in practice you’ll end up with a common Desktop to all your devices. Of course, that’s if you have several devices with the same OS. If you don’t have a Synology NAS, the same could be done with Bittorrent Sync, or even a cloud storage services like Dropbox, Google Drive, etc – you only need to take care on space and file size limitations.